Hello everybody! Another amazing month! Tons of new members and new music on the site to check out, as well as a lot of new updates throughout the site, such as our new MuzicNotez BRANDED Website Packages! More From Mr. Profane To Mr. Profane for flying through our rankings! He’s an Arena Act already and has 50 killer tracks for you to check out! He’s a young entrepreneur doing something creative specializing in Hip Hop music. He began rapping at the age of 13 only to become a multi-talented writer and lyricist. His style is a mysterious breath of fresh air, and an exciting energetic boost to the nervous system! With MuzicNotez Branded Musician Websites! Want a personal website to showcase your music professionally created by the creators of MuzicNotez? Take it up a notch with our MuzicNotez Packages where we offer you much more to take your music to where it needs to be! Get your own MuzicNotez BRANDED Website Package which includes many great features as well as getting placement on our branded portfolio display. We will also be labeling your MuzicNotez profile as a honorary package member and give you newsletter promo spots. 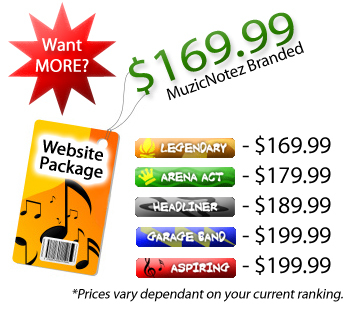 Prices for this website package vary depending on your MuzicNotez ranking, the higher your ranking, the lower the price! Let us know if you have any questions. We have many more packages on the way so stay tuned! View More Here! I Have Lived My Life!